Sad news has spread out among sailors and sailing lovers at the end of March this year. Hobie Alter, also known as the Henry Ford of the surfboard industry passed away at the age of 80. I was never too much involved in surf sports but my sailing career is strongly linked with the late Mr. Alter. 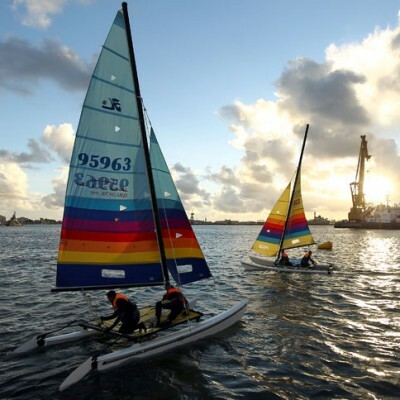 My first sailing maneuvers took place years ago in New Zealand aboard globally popular Hobie Cat, the lightweight double hulled sailboat for two. I heard about the name of Hobie Alter as a surfers’ legend but have never linked it with Hobie Cat. I always thought it was for hobby and catamaran, not understanding why spelling is different. However, Mr. Alter developed the concept for my first sailing boat back in 1960’s. As a passionate surfer, he was frustrated when strong offshore winds were blowing in Southern California, flattering wave tubes, so cherished among surfers. His idea was to give surfers something to do when they can not ride their boards. Therefore he spent his time developing the idea of light, downsized version of a catamaran which would be easy to assemble, maintain and steer in order to provide the ultimate thrill of sailing. The first model was launched in 1968 as 14-feet long catamaran with one mast and two sails. Hobie Cat became so popular that over 1000 of them were sold in the first two years of being present at the market. The price was 1200 USD while its popularity rose exponentially. Unlike standard sailing boats, Hobie Cat does not cut through the water but skitters across the surface drawing only few inches. Hobie Alter developed the technique and materials and managed to construct the vessel that light so sailor could easily right it by hauling lines attached to each hull in case of being knocked over by a gust of wind. Famous America’s Cup catamaran designers remember their rides with first models of 14- and 16-feet Hobie Cats, stating that catamaran design would not be there where it is today without Mr. Alter’s inventions. Some of them compared sailing Hobie Cat with going to a rock concert instead of going to a regatta. Many of Hobie Alter coevals claim that he was always a kid in the body of a man, approaching all his inventions as toys made for fun. Hobie Alter was one of the first fifteen inductees in the National Sailing Hall of Fame in 2011.